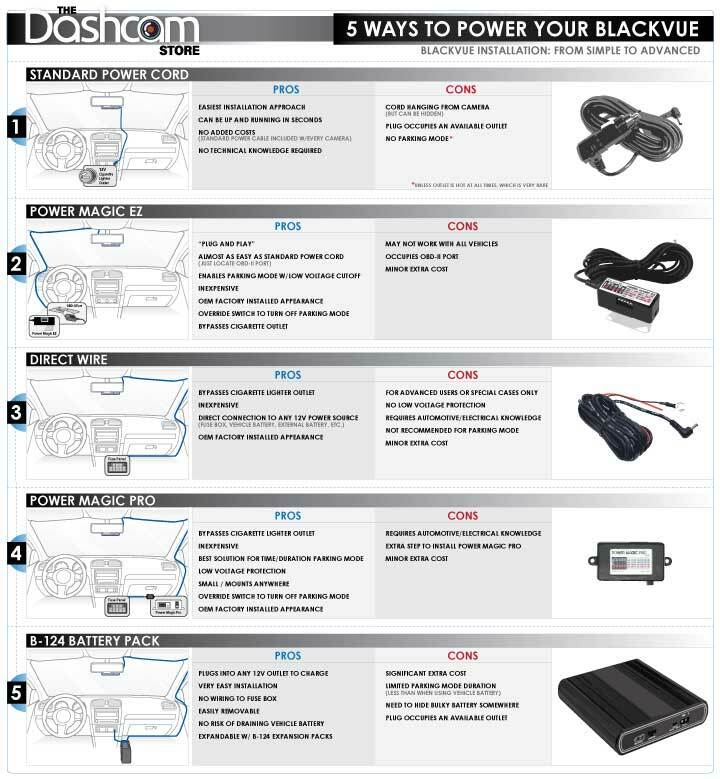 There are five very different methods you can use to install and power a BlackVue dashcam inside your vehicle. We have listed out the methods in order of complexity, from simple to advanced. Please note that while this was post written for BlackVue specifically, these methods will apply to just about all dashcams and dashcam brands. The first and most simple method is to use the standard 12V power cable that comes standard with most dashcams. It is intended to plug right into your cigarette lighter outlet for power while your vehicle is being driven. The benefits to this most basic of configurations are not only its simplicity and instant installation, but also the fact that no additional costs are required, since nearly all dashcams come with a standard 12V power cable. One of the biggest benefits to users, aside from the easy plug and play, is that no technical knowledge is required for the installation. A few down sides to this method must be noted. First, and likely the biggest deterrent is that your power cord will be hanging from your camera in plain sight (although, you can still tuck the cord around the headliner if so desired). Another drawback is that your cigarette lighter outlet is also now unavailable, which you may need to charge your cell phone, for example. More importantly, you will not be able to utilize the “Parking Mode” feature of your dashcam, unless your cigarette lighter outlet is always hot, which is extremely rare. The next on our list is BlackVue’s Power Magic EZ, the easiest of all "installation" methods. It’s almost as easy as using the standard power cable mentioned above. The EZ is equipped with a low voltage safety cutoff, so you can take advantage of your dashcam’s “Parking Mode” feature without fear of draining your vehicle’s battery. There is also an override switch on the device should you want to turn “Parking Mode” off. Not only is it an inexpensive upgrade, but it also leaves your cigarette outlet available and gives your camera the appearance of an OEM installation. A few downfalls to this approach are the extra cost of the module, minor as it is, along with your OBD-II port being occupied by the EZ. We have also run into a few vehicle types that device will not work with as intended. In time, BlackVue will correct this issue, but for now, make sure it works with your vehicle type before purchasing. Third on our list is a Direct-Wire power harness. This is also an inexpensive method that will leave your cigarette lighter outlet free and give you that OEM installed look. These are easily connected to any 12V power source, like your fuse box or a 12v battery. We do not recommend this method unless you are an advanced user who can work with the lack of low voltage protection. We also do not recommend using “Parking Mode” with the Direct-Wire Harness strictly due to its lack of low voltage protection. You wouldn’t want to risk draining your vehicle’s battery inadvertently. This also comes with an additional minor cost to purchase the harness, and you need to have some automotive/electrical knowledge to complete the install. Next in line is the Power Magic Pro, which is a very reliable and inexpensive solution. With the PMP you can safely utilize “Parking Mode”, but also turn it off via the override switch on the side of the unit. Given the extremely small footprint, the PMP can be mounted anywhere inside your vehicle. The time settings can be set to run “Parking Mode” infinitely, or for just a few hours, making this the best solution for timed “Parking Mode”. The low voltage safety protection will ensure you do not drain your vehicle’s battery. Since the PMP connects to your fuse box, your cigarette lighter outlet will be available for other uses. You will need some automotive/electrical know-how to complete this install. The PMP will be in-between your fuse box and camera, so it does require that one extra step. You also must consider the minor upgrade cost to purchase the device. Last on our list is the B-124 Battery Pack from BlackVue. This will plug into any 12V outlet to charge and is very easy to install. Since the battery is not wired to your fuse box, it is very easy to remove. These are also expandable using the B-124E expansion packs to add some extra power. The battery serves as the only source of power for your dashcam, so there’s no risk of draining your vehicle’s battery. The B-124 is the most expensive solution on our list and is also the largest and most difficult to hide. You will need to use one of your few 12V outlets and will have also limited “Parking mode” availability. The batteries do not possess enough power to run “Parking Mode” for an extended amount of time (12+ hours). But the more B-124E expansion battery packs you have, the longer “Parking Mode” will run. So, there you have it, 5 unique and effective ways to power and install your dashcam. If you have the slightest doubt on how to install your dashcam, either give us a call, or contact a local car audio installer who can help you. We hope this helps you with your decision, but please do not hesitate to reach out with any questions you may have. We do hope this quick explanation will help you make an informed decision and set expectations as to what each installation method can do for you. Get our blog posts, top resources, and exclusive offers delivered to your inbox. Subscribe, and get 5% off your first purchase with us!